Installation view of Linde Ivimey’s ‘Dana Bergstrom’, 2018, mixed media, 82 x 38 x 25cm; ‘Marilyn Ball’, 2018, mixed media, 95 x 63 x 30cm; ‘Jack Egerton’, 2018, mixed media, 46 x 34 x 110cm; ‘Kate Kiefer’, 2018, mixed media, 97 x 64 x 23cm. Courtesy: the artist and Martin Browne Contemporary, Sydney. 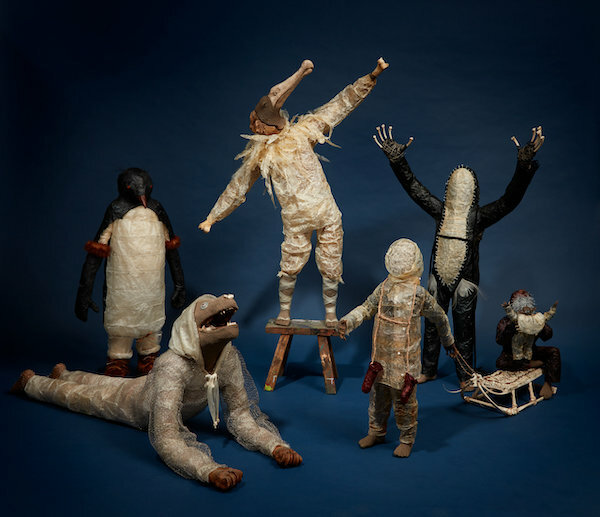 Women to Winter introduces a collection of new works by Linde Ivimey that have been made in the Alaskan arctic region about the people and their animal totems. Linde Ivimey was fortunate to learn and share in the strong and ancient connections that exist between them through hunting, ceremony and dance. Ivimey learnt from the vastly different peoples from each area and notes the one thing they share passionately; care for their pristine ice environments and the wild life. The smaller works were made on the go, with only materials at hand or found along the way, the larger works were commissioned for the National Portrait Gallery Gallery’s twenty-year anniversary exhibition; So Fine Contemporary women make Australian history.